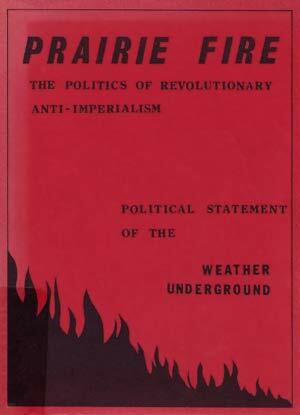 Here is PRAIRIE FIRE, our political ideology – a strategy for anti-imperialism and revolution inside the imperial US. It comes out of our own practice of the last five years and reflects a diversity of experiences. This paper is not the product of one or two people, nor even a small handful of us. Rather PRAIRIE FIRE represents the politics and collective efforts of an organization. It has been the focus of our study groups and our political education. It has been chewed on and shaped in countless conversations, struggles and written pages. It has travelled around the country, growing, developing thru the attempt to understand the shape of world forces and the revolutionary possibilities before us. The paper was rewritten four times and collectively adopted as the political statement of the Weather Underground. The twelve-month process of writing PRAIRIE FIRE, squeezed between on-going work and practice and action, has now reached a kind of end-point. A cycle is done. We undertook this analysis to explain the changes in US and world conditions since the Vietnam ceasefire and to evaluate the consequences of the Vietnamese victory. We have come some distance in evaluating the political situation, the priorities for revolutionary work since we began this writing. Now many more revolutionaries will need to shape and change the paper. The politics cannot be realized unless and until the content of the program is activated in thousands of situations, among thousands of people in the coming period. PRAIRIE FIRE will be a growing thing. We hope the paper opens a dialectic among those in the mass and clandestine movements; we hope people will take PRAIRIE FIRE as seriously as we do, study the content and write and publish their views of the paper as well as their analysis of their own practice. We will respond as best we can. Our movement urgently needs a concrete analysis of the particular conditions of our time and place. We need strategy. We need to battle for a correct ideology and win people over. In this way we create the conditions for the development of a successful revolutionary movement and party. We need a revolutionary communist party in order to lead the struggle, give coherence and direction to the fight, seize power and build the new society. Getting from here to there is a process of coming together in a disciplined way around ideology and strategy, developing an analysis of our real conditions, mobilizing a base among the US people, building principled relationships to Third World struggle, and accumulating practice in struggle against US imperialism. PRAIRIE FIRE is written to communist-minded revolutionaries, independent organizers and anti-imperialists; those who carry the traditions and lessons of the struggles of the last decade, those who join in the struggles of today. PRAIRIE FIRE is written to all sisters and brothers who are engaged in armed struggle against the enemy. It is written to prisoners, women’s groups, collectives, study groups, workers’ organizing committees, communes, GI organizers, consciousness-raising groups, veterans, community groups and revolutionaries of all kinds; to all who will read, criticize and bring its content to life in practice. It is written as an argument against those who oppose action and hold back the struggle. We have only begun. At this time, the unity and consolidation of anti-imperialist forces around a revolutionary program is an urgent and pressing strategic necessity. PRAIRIE FIRE is offered as a contribution to this unity of action and purpose. Now it is in your hands.